No piece may move over any other piece--an opponent piece is either "captured" (by being removed from the board and replaced immediately by the capturing player's piece) or movement is stopped before reaching that piece. The Knight appears to be an exception to this rule (because its movement is not restricted by any other piece or pieces which may be in place between its starting point and its destination), but the Knight movement is unique in that no other piece may duplicate (and therefore impede) its action. 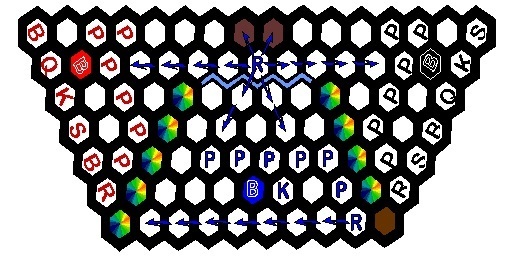 The Rook moves and captures "through the sides" of a hexagon. It can move in any direction, and can move as many spaces as are "open to it" within its "line of travel". The Bishop moves and captures "through the corners" of a hexagon. It can move in any direction, and can move as many spaces as are "open to it" within its "line of travel". The Queen moves and captures like either a rook or a bishop, according to choice, within a given turn. The Queen can move in any direction, and can move as many spaces as are "open to it" within its "line of travel". The King moves and captures similarly to a Queen, but with a range of only a single space within any given regular turn. The King can move in any direction as long as it does not expose itself to "check" or "checkmate". The Knight (S = Springer, Euro.) 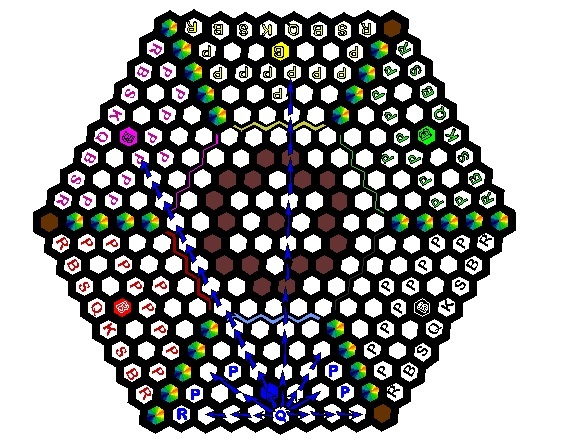 has a unique movement and capturing method best described as a "single-space rook move" followed in the same turn by a "single-space bishop move", or a "single-space bishop move" followed in the same turn by a "single-space rook move", always moving "away from" it's initial point of location in a given turn. The Knight can move in any direction. The Pawn moves like a rook, but is limited in rangeone space per move, except on its first move, which may be two spaces. The Pawn captures like a bishop, but is limited in range to one space. In the central area of the board, a pawn may capture in any direction. In the image below, the blue arrows indicate possible moves by a Blue pawn, green arrows indicate possible capture directions by a Blue pawn, and red arrows indicate movements or capture directions that are prohibited for a Blue pawn. In the Central area of the board a pawn may move or capture one single space in any direction. 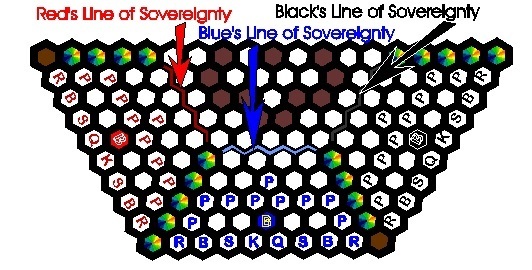 On its very first move, any pawn behind the Line of Sovereignty may move two spaces. Thereafter, however, a pawn can move only a single space. Additionally, any time it moves, a pawn must continue to move away from the outer edge or first rank of its own Sovereign Territory until it crosses the Line of Sovereignty. Once a pawn crosses it's own Line of Sovereignty, it may move in any direction, but it may not cross its own Line of Sovereignty and thereby return to its own territory. Additionally, any pawn which enters an active opponent territory by crossing another Line of Sovereignty can only proceed from that entry point toward the outer or first rank of the opponent territory, where promotion occurs. When inside any territory, a pawn may not move "sideways" (that is, in a line which parallels the territory's first rank) or backwards (toward the first rank when in its own territory, and toward the Line of Sovereignty when in an opponent's territory).